The future is in sober and moral people and even nations, and the future of any nation – are, first of all, its children and youth. That’s why an accent of teetotalling and outreach activity in mass aspect should, one way or another, be oriented primarily on the rising generation. 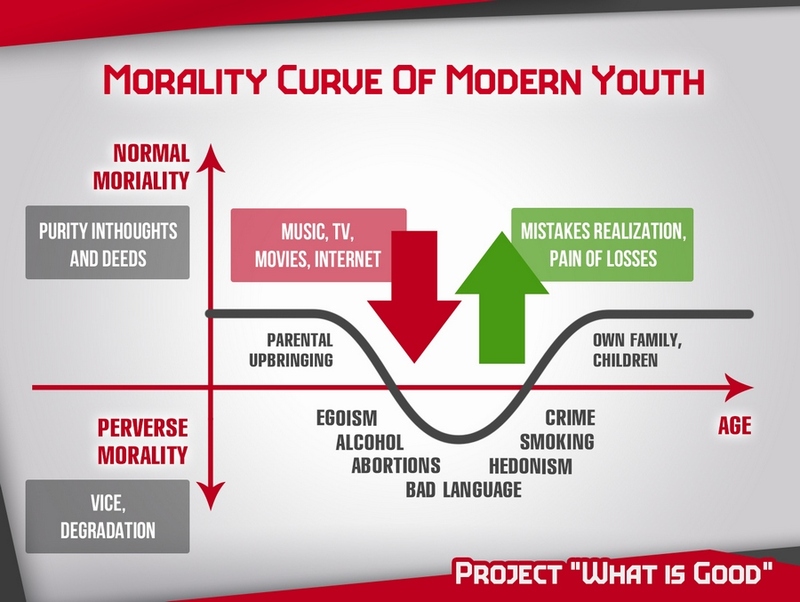 In this article I would like to pay a reader’s attention on one scheme named the “Morality curve of modern youth”. The scheme is relative enough, but it allows getting presentative and visual impression about the main factors, which have an impact on morality of oncoming generations. So, schematically it is shown, that in most cases in a child a family gets rather good level of upbringing during fledging years, parents care about her, show love, try to cultivate good moral qualities, teach numerous of skills and so on. Of course, life is not ideal, and families differ, but nevertheless, practically every parent sincerely wishes his/her children well, sees their future in him/her and tries to form a positive environment for development, in which a child is going to learn and socialize, on the one hand, and on another – gradually form as a Human with a capital “H”. But children grow up and little by little are getting out of parental control, increasingly entering into an independent life and more and more facing external world. Here I’m talking about not so much about physical space – nearby street, as modern information flows, in which a person merges while coming-of-age, and which are starting to fill her worldview, affect her thoughts, wishes, and, finally, behavior. If in the beginning these are separate cartoons, films and songs, which commonly pass some inspection from parents’ side, then while moving into adulthood the volume of various media content and the extent of involvement is starting to increase quickly. Statistically, modern teenagers spend in front of monitors, cell-phones and TVs several hours a day, most of the time consuming a so-called entertaining content, which refers to mass “culture”. According to the analysis of the main spheres of mass “culture”, which surround us, carried out as part of the project “What is Good”: modern music, TV, cinematograph and so on, inner algorithmic of this dominating information flow is extremely destructive, and is resulted, at bottom, in veiled propaganda of various vices and upbringing of weak lacking willpower atomized personality, oriented on satisfaction of her instincts. But since the majority of the society still does not realize this influence, and all the more does not have an understanding of controlled character of forming tendencies in this sphere, then security measures from such information aggression are not being taken. As a result children while moving into adulthood gradually absorb all these destructive algorithmics through numerous bright and attractive screen images, and start to realize them in their behavior. You can see clearly in the graph how this is being reflected in their lives. One can’t envy a modern typical teenager: the most frequently on sub-conscious levels of mind in her head there is a constant war between those values and ideals, which parents have put in her in a family, and those life goals, which are being formed under non-conscious to her influence of surrounding informational environment. It is mostly being expressed in illogical inadequate behavior, in that a person does not know, what she wants, can’t control her emotions, behaves half-heartedly and so on. Unfortunately, a school does not serve a helper in this situation, since pedagogic aspect has been practically excluded from the modern educational system, and besides for teachers it is often challenging to withstand bright and tempting images of virtual world. In all these process a separate column has a subject of sobriety deprivation. And is this aspect, unfortunately, the majority of parents, alongside with main heroes of practically all movies, show children bad examples, themselves helping them to make this wrong choice. And if such things are being purposefully put in films, then parents more often simply do not realize consequences of their actions. In moral aspect alcohol, tobacco and other drugs for a teenager serve some trigger point, helping to do violence to conscience and all that constructive, that has been raised in family, and go the vole. How deed this hole, which the graph shows, is, in which statistically probably are found very many teenagers, and will they be able to get out of it, come back to normal life, create their own strong family, get rid of double moral standards, formed during growing-up, depends on many factors and, first of all, on a will of the guys themselves. However, one can certainly say, that conscious sobriety and its popularization serves one of the main defense elements from pointed out information aggression, as for a separate personality, so for the whole society. At that forming the skill of recognition of inebriation technology, realization this outer information aggression even as part of separately taken aspect, is a good foundation for developing critical thinking, necessary for distinguishing other destructive programs, put behind the sphere of the modern mass culture, in general. Also due to that graph one should combine teetotalling agitation with explanation of the subject of influence the mass media on society, in those cases, where it is possible and appropriate, focusing on the importance of maintenance of moral origins and family values.